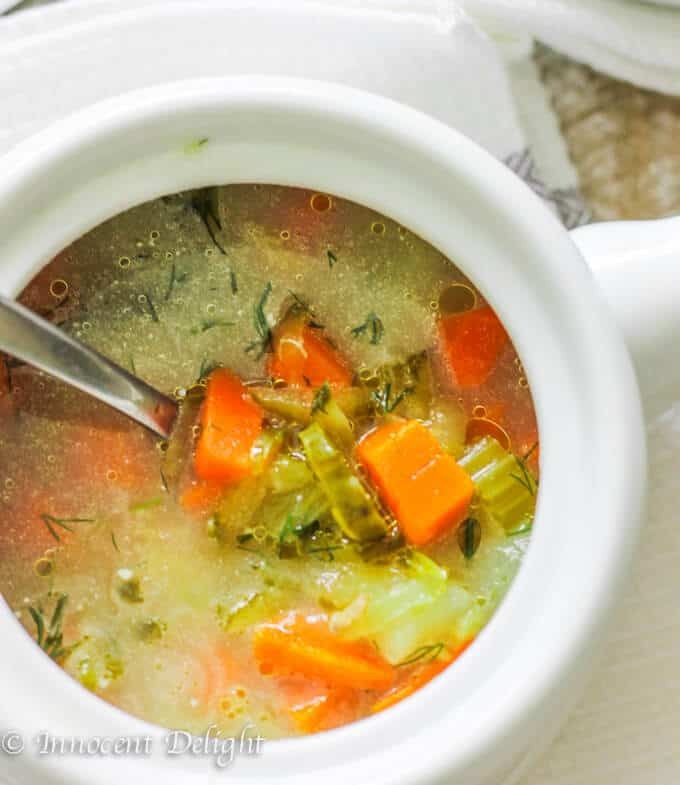 This Dill Pickle Soup (or “Zupa Ogorkowa” in Polish) is the most popular Polish soup of them all. 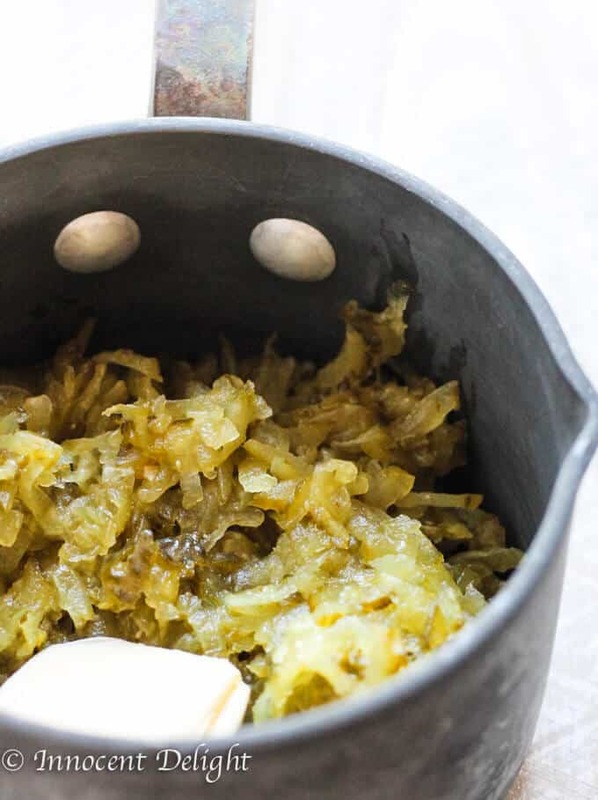 Here, you will find a traditional Polish recipe for pickle soup. For some, it may sound strange, but if most Polish kids love it, then there must be something to it. I lived in Poland for the first 29 years of my life and literally, I had never heard of a person that wouldn’t like a dill pickle soup. It has a tang, but that tang is tempered by the cooked pickles. Some might perceive this soup as having a sour broth, but really it is super mild with a little backend tang. In fact, you can actually control the sourness of this soup and accommodate different palates. If you like more then mild tang, then you can always adjust it with the pickle water. 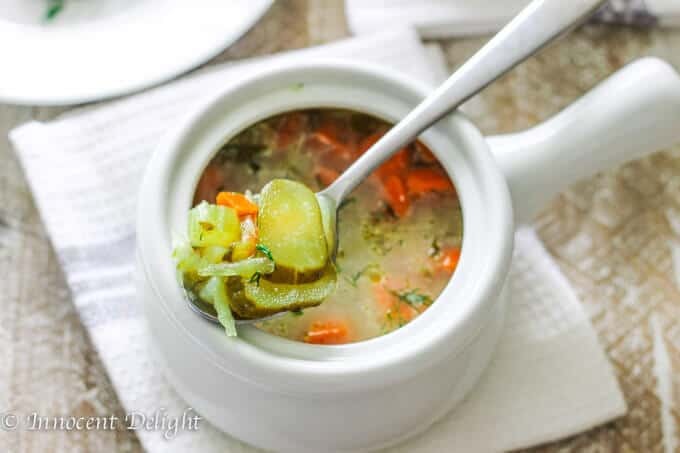 However, there is one very important thing that I need to mention right at the start: You CANNOT use pickles in vinegar for this Polish pickle soup. Translation, that means that most of the stuff that you find in a regular supermarket will not work. On the below photo you will see the jar with pickles that I usually buy for my soup. I am not affiliated with this company and I do not receive any compensation for showing you their product. I just love these pickles and use them all the time. But I think that any cucumbers in brine would work for this recipe. 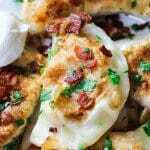 Now, obviously every Mom and Grandma from Poland would tell you that their soup is the best and the most authentic, but I think that all of them taste amazing and they do not differ much in terms of ingredients and cooking methods. One distinguishing characteristic thing about Polish soups is the fact that they are ALL made based on a meat broth. So you start every soup by putting a piece of meat on the bone into the pot, add veggies, salt, spices and let it cook for a while. For this pickle soup, the traditional meat is baby ribs. You can cut a couple of ribs from the rack and add to the pot (throw the rest in the crockpot and you’ll have another dinner :). That’s exactly what I used in this recipe. 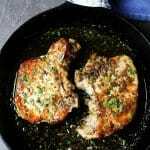 But any meat on the bone would work (it can be chicken corpse, or legs, or a piece of beef on the bone). I’m referring a lot to the meat on the bone because it actually makes the best broth. And if you use good quality meat it’s also super healthy. But the beauty of this soup is that you can actually make it vegetarian or even vegan. then add the vegetable stock, season it and cook until veggies are done. From there, follow with the rest of this recipe. Traditionally this soup needs to be finished with a dollop of sour cream (you can use heavy cream instead if that’s what you prefer). If you want to go vegan, simply sauté veggies in some olive oil (or other oil of your choice) and skip the cream. TIP: One more super important trick to keep in mind when you’re cooking this soup is that you’ll have to cook the pickles separately and then mix them into the broth at the end. Cooking everything together is the most common mistake made by young Polish cooks. I made this mistake myself when I was in my early twenties, and my soup (although the taste was delicious) was weird and far from what my mom used to make. All my veggies were sort of hard and crunchy and they should have been soft. Pickles are sour and potatoes, carrots, and other root vegetables will not cook well in a sour water… Who knew? I didn’t make this mistake ever again. So, now I cook my broth separately and I sauté pickles with a tablespoon of butter first, and then add a little water and let them cook for a half hour or so. Another distinguishing fact about Polish soups is that they’re also chunky. Traditional Polish soups are never blended. 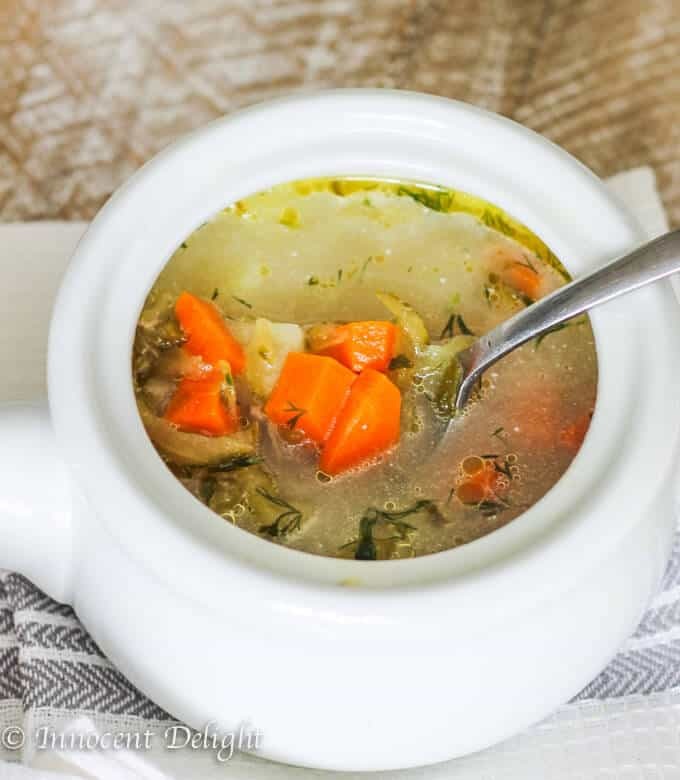 There may be some new soups with foreign influences that will be blended or creamed, but traditional soups are chunky with all the root veggies cut up and cooked well in a broth. 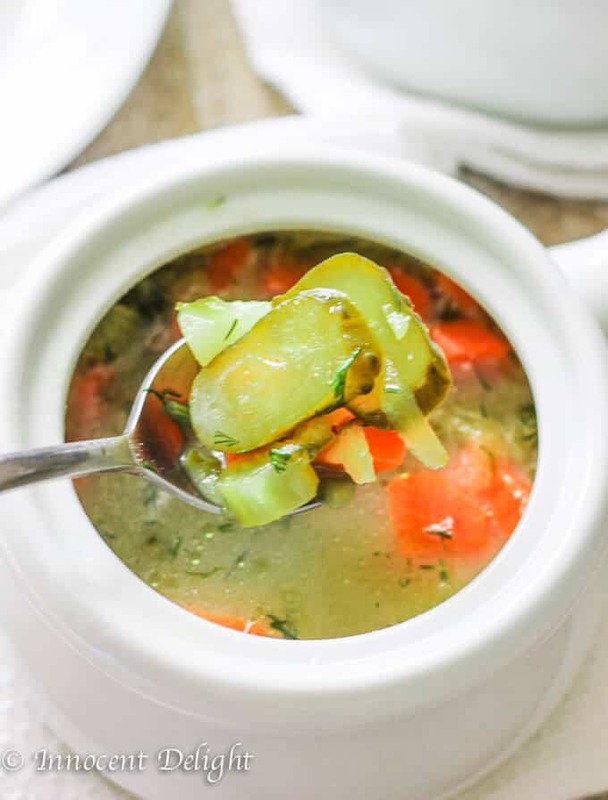 If you want to make this pickle soup creamed, go ahead and use your blender (affiliate link). My son loves it this way. 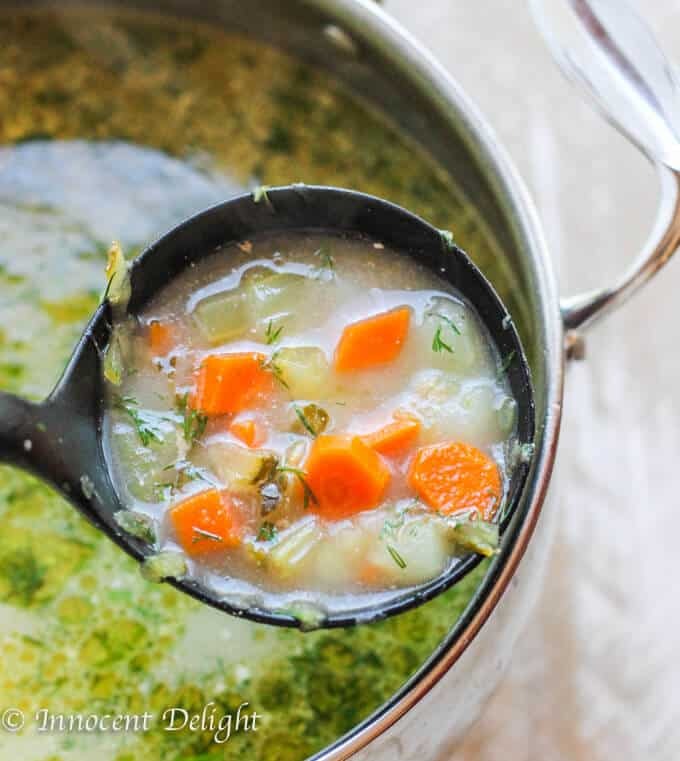 Dill Pickle Soup - traditional Polish Recipe aka Zupa Ogorkowa. The most popular Polish soup of them all. For some, it may sound strange, but if most Polish kids love it, then there must be something to it. Because the soup is sour you don't want the cream to separate. That's why it is important to add a little hot soup to the cup with cream and mix it a little bit at the time. This will work well and your cream will not get separated. Cannot believe all the ingredients that goes into this soup. Looks fantastic! A wlasnie ze szukalam przepis na zupe ogorkowa! Jedno pytanie: ile gram tych zeberek? A jezeli nie mam zeberek…w ich zamian, co moglabym uzyc i ile? Np. kosci kurze? Hej Monika, 3-6 zeberek wystarczy, mozesz uzyc kurczaka jak nie masz zeberek. That soup sounds absolutely amazing! I love the idea of it – all that sharp sour and savoury. Gorgeous! What an incredible use for pickles???!!!! And it was my mother too, who taught me never to try and cook vegetables in a tangy medium. In Indian food, we use a lot of tamarind, but it’s always added at the end, after the vegetables and spices have cooked. There’s more wisdom that’s handed down from family than we could possibly ever get through cookbooks. 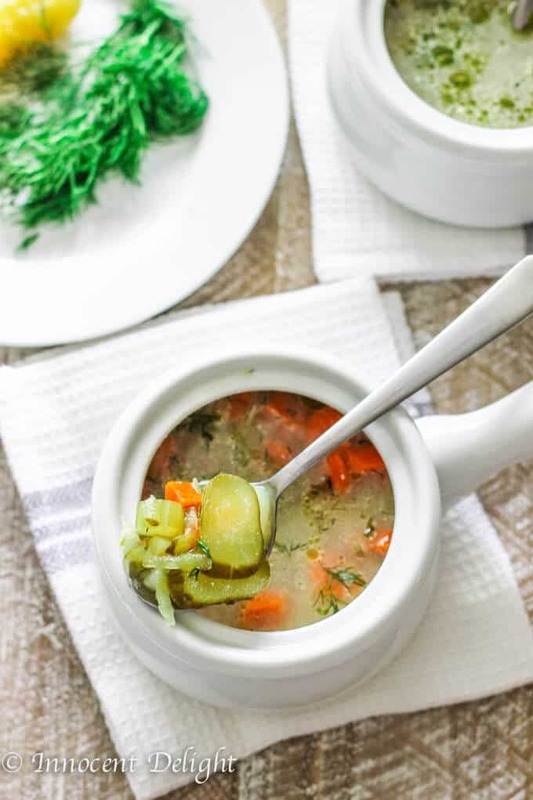 This is the first time I’ve heard of pickle soup – but I loved reading your post, because it lends so much insight into the culture… Brined pickles instead of vinegar based, baby ribs or chicken “corpse” – I laughed out loud at that and the fact that the pickles had to be cooked separately! I’m intrigued. Thanks Lisa! I’m glad you had a good time reading my post! 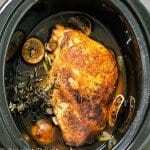 If you decide to try this recipe, let me know how you liked it! How simply intriguing. I have never heard of this Polish dill pickle soup! I think when one thinks of pickles, we think of dill pickles! 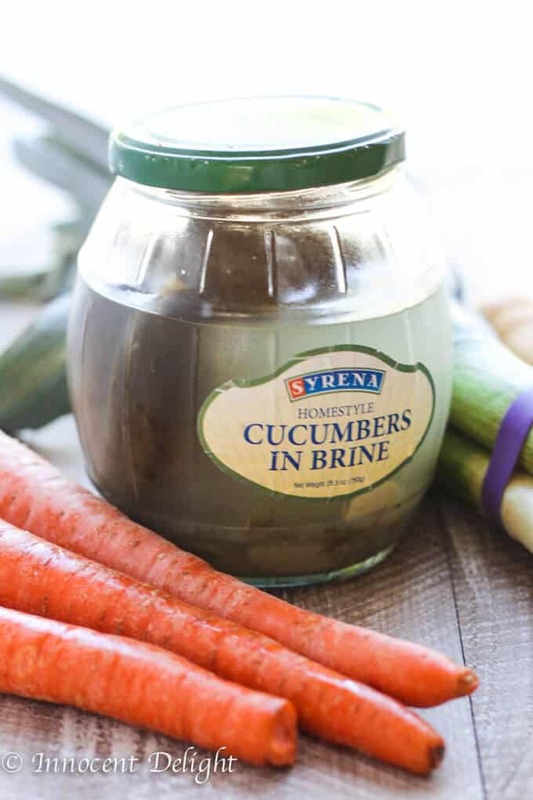 I’m glad you mentioned you need the ones in brine. 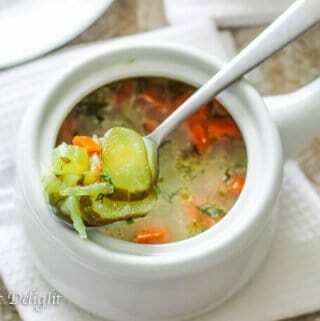 I have to make this soup soon as I love all types of pickles!! Great! Thanks Elaine. Let me know how you liked it! I have not had this before, but I know I must! Saving to try. So you do not keep or eat the parsnips or leeks? I was confused by that, because I love both so much! Are they just strictly for the broth and do you leave the meat in the soup from the ribs or are you just making the broth from the bones? Hi Christy, I personally take both leeks and parsnips out as I cook them whole in the broth/soup (that’s the Polish thing). But you can chop them like carrots and potatoes and keep them in the soup if you like them. Yes, the meat stays in the soup. You need two pots: one small for cooking pickles with butter and the other big one for cooking the soup. I’m not making separate broth from the bones. In Poland, we cook everything in one pot: meat and veggies. But you can adjust if you want to. I just wanted to present the real version of this soup from Poland. Hi! I was wondering what the best method is to freeze it? I wanted to send it to a friend.